Craig photographer, George Welch, took this 1927 photo showing Ben L. Wright standing in the back row center with the Craig Baseball team he sponsored through his clothing store. Wright was an avid booster of Craig, and enthusiastically promoted the town and its activities along with his men’s clothing business. Internet and catalog sales are an enormous part of today’s world of commerce bringing products and services from around the globe to doorsteps sometimes thousands of miles away. The idea of marketing outside a specific geographic area was nothing new to an enterprising Craig businessman 100 years ago. Twenty-four year old Ben L. Wright came to the Craig area in 1910 and homesteaded near the Bell Rock area west of town. Armed with an ample supply of optimism and a lamentable lack of farming knowledge, Ben managed to prove up on his land but found himself deeply in debt. In 1915 he sold out and decided to turn his hand to dry-cleaning. There were plenty of naysayers who felt Craig was too small to support such a business, but Ben forged ahead, investing in the necessary equipment to set up a small shop at 515 Yampa Ave. To help grow his business, Ben offered mail order service for dry cleaning, and it wasn’t long before the daily local train was arriving with bulky packages from other Yampa Valley towns, containing soiled garments in need of cleaning. Large numbers of packages also came in through the U.S. Post Office. It was a sort of “internet online service” 1915 style! The Suitatorium, as Ben called his dry-cleaning business, soon flourished to the point that he needed to expand his operations and building size. In 1918 he tore down the small frame building that he was in and rebuilt a larger handsome brick structure, which still stands today. He added a small selection of men’s furnishings (as clothing items were so elegantly called at that time) and the business kept growing still. In 1926, Ben built yet another larger building at 29 W. Victory Way (which today houses The Jungle Pet Store). He celebrated the opening with a two-page advertising spread in the Craig newspaper. He touted not only the virtues of his own business, but with his usual generous spirit, pointed out the merits of all those involved in the construction of his new building. In this larger venue, Ben built up a large inventory of men’s suits and other clothing items. He distributed a large mail order catalog throughout a hundred mile radius of Craig, which continued to expand his business. Ben’s secret to success appears to have been a combination of hard work, generosity, integrity, offering of mail order options, genuine customer service, and heavy investment in advertising and promotion. Ben wholeheartedly believed in Craig, which is obvious from his promotions and the support he threw into local activities and events. 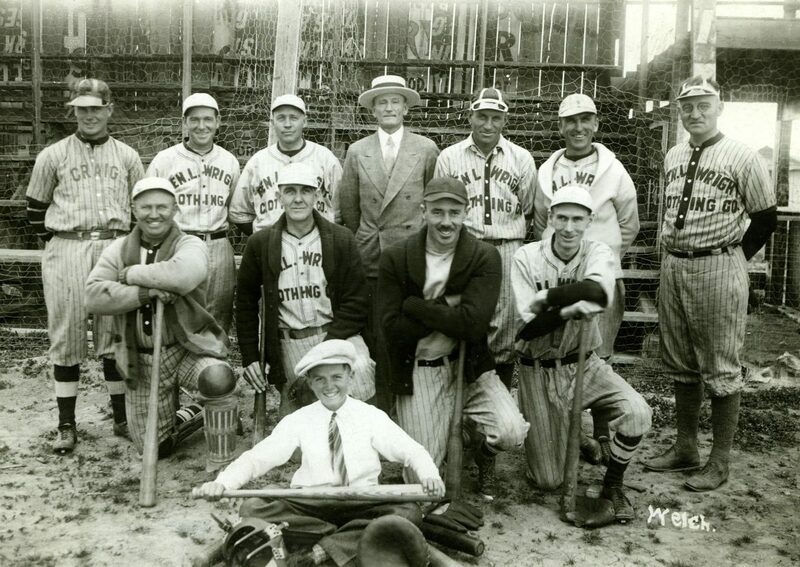 The Museum of Northwest Colorado has a photograph dated 1927 showing a Craig baseball team sporting uniforms proclaiming “The Ben L. Wright Clothing Co.” Ben, sponsor of the team, can be seen smiling proudly from the back row. Another photograph in the museum’s collection shows Ben standing in front of his store next to a large wooden barrel with lettering on the side inviting the passerby to “Jump Into My Barrel While I Press Your Pants!” He was always looking for a way to promote his business with unusual grabs for the consumer’s attention. It must have worked because Ben’s business, which had started in 1915, flourished until the Great Depression. Even then it managed to hang on until finally succumbing to the struggling economy around 1938. After closing his men’s clothing store, Ben moved with his wife and three children to Grand Junction where he worked as a traveling salesman and advertising specialist. He later moved to Denver where he worked in the hotel industry. Ben died in 1962 at the age of 76. With his flair for advertising and promotion, and his vision for offering mail order sales and services, Ben very well might have survived longer as a purveyor of “gent’s furnishings” if it hadn’t been for the poor economy. He offered real service and value to a small rural community that appreciated his honesty and his business acumen. Today, with the proliferation of online shopping and services, it is still good to remember that our many locally owned businesses, like Ben’s, are the biggest supporters of our local community events and fundraisers. The energetic and entrepreneurial spirit of Ben L. Wright continues to live on today in Craig, and it will continue to thrive as long as the community continues to support local businesses.